It’s Truck Month at Melloy Dodge, and there are many impressive features in our Ram 1500 models that set Ram apart from the competition. One of those features worthy of highlighting is the available air suspension. Ram 1500 has available class-exclusive Active-Level™ Four-Corner Air Suspension. This feature is standard on the 1500 Limited models, and is an option you can add to all others. Air suspension provides automatic load leveling, and improves overall capability. 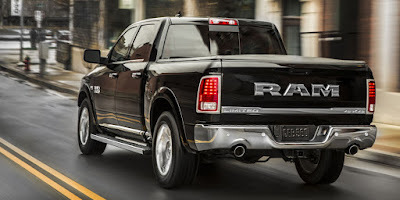 You can utilize the adjustable air springs to raise and lower the air-equipped Ram 1500 through five ride-height settings, and all through the controls on the dashboard. Got some rough stretches on the ranch? Or like to explore the remote back roads of New Mexico? Those same dash controls allow you to manually adjust the Ram’s clearance for those particularly tough spots. Additionally, the Active-Level™ Four-Corner Air Suspension system is equipped with intelligent sensors that lower the Ram 1500 at highway speeds, reducing drag and increasing fuel efficiency. For years, people have been adding aftermarket air suspension systems to their trucks to improve capability and functionality. Those systems were usually for universal application, not for a specific vehicle, and weren’t completely reliable. Now, Ram is the first to offer reliable factory air suspension in this vehicle class.